Ecological restoration does not come without risk. An enormous amount of resources are spent on a practice for which we are still asking questions and trying to fully understand to achieve desirable outcomes. We have explored two key constraints and opportunities for reducing risk in a case study of over 1000 species important to ecological restoration in temperate European grasslands in a new paper; “Native Seed Supply and the Restoration Species Pool”. The risk in ecological restoration is strongly related to the amount of constraints in a restoration project (Suding, Gross & Houseman 2004). If we can reduce constraints, we reduce risk and improve the capacity of ecological restoration to be a stronger complementary conservation action. Successful ecological restoration depends on selecting appropriate species to cope with abiotic and biotic characteristics of degraded habitats. For many projects, it is impractical to collect a biodiverse selection of seeds in large quantities by hand, and in addition, wild populations risk depletion. A major constraint to ecological restoration projects is the seed supply that is available from commercial or institutional seed suppliers. The ‘restoration species pool’ (‘RSP’), or pool of species available from these seed suppliers, imposes a critical filter on the biodiversity that is available for use in ecological restoration projects. Where an appropriate native seed supply lacks, easily available agronomic or horticultural seeds are used as a substitute, which is ecologically unacceptable. In addition, native species can be much more difficult to cultivate than agricultural species, which have been selected for performance. Germination requirement and production handling can be complex, and the germination rates of wild species can be low (Marin et al. 2017). In addition, cutting edge research is not always available to the public, practitioners or seed producers that may need it. These challenges require collaborative efforts between sectors. Temperate grasslands of Europe are incredible hotspots of biodiversity and are key habitats of conservation concern. 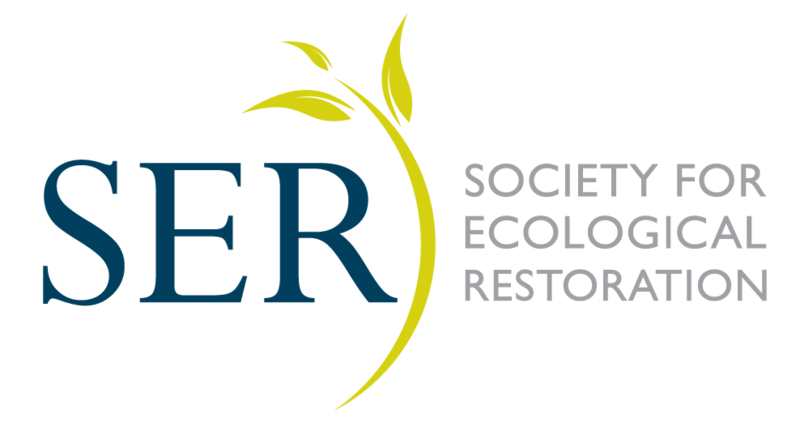 Many are in decline and require ecological restoration for habitat improvement. We surveyed seed availability of our case study species within 17 seed suppliers across 17 countries in the European continent. To assess the availability of seed quality data, we collected trait information on germination temperature and dormancy type of the target species available from the Seed Information Database (SID) (Royal Botanic Gardens Kew 2008), and the most recent review of seed germination studies (Baskin & Baskin 2014). As these are the main traits related to the germinability of a seed lot, we assume that having this information implies a minimum contribution of the scientific community for a given species. We have found that only 32% (ie. 358) of the case study species have both germination data available and are commercially available from seed producers overall. Some seed supplies may not be appropriate for use in every region, and so this compounds the picture and the actual availability of appropriate seed might be quite a bit less than we estimate here. Nevertheless, we can get a good overall picture of how well represented certain taxonomic families, genera and species are within a dataset like this, which can be very powerful for understanding the current state of the overall situation and useful for improvement. 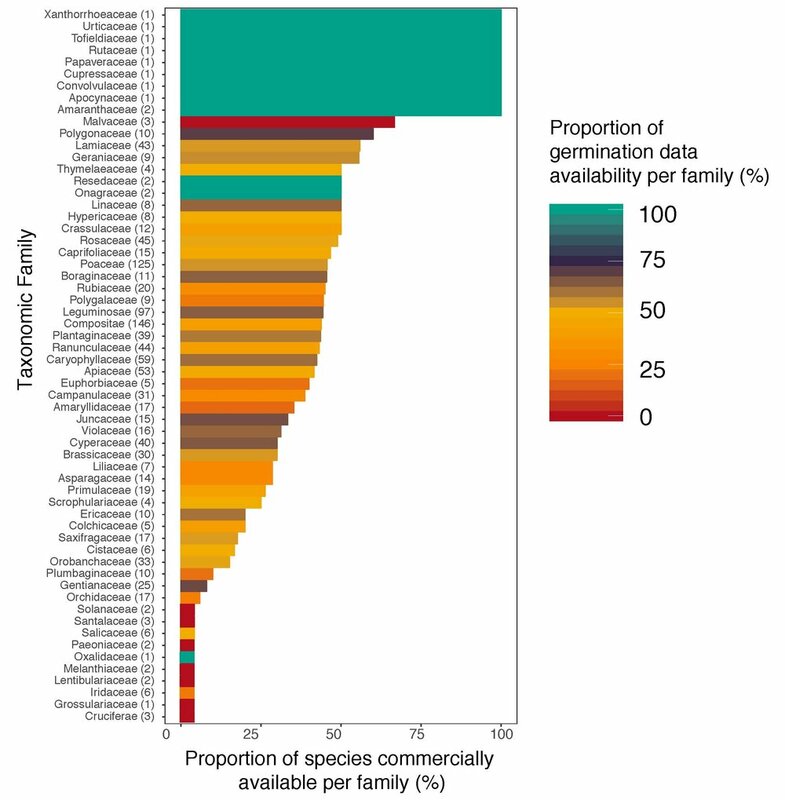 Key: Bars show the proportion (%) of species per taxonomic family that have seed which has Commercial Availability. The degree and proportion of Germination Data Availability is represented by the color scale according the Seed Information Database (Royal Botanic Gardens, Kew, 2008) and (Baskin & Baskin 2014). The numbers in brackets next to each family name represents how many species are included in the dataset from that given family (Ladouceur et al.). We agree that biodiversity is not a lending bank, and should not be treated as such (Bekessy et al. 2010). Reasoning habitat destruction with the promise of ecological restoration will surely result in biodiversity loss. However, large-scale ecological restoration is necessarily taking place and we must urgently work collaboratively to ensure that we reduce risk for this to truly realise it potential as a complimentary conservation action that can achieve extraordinary outcomes. We suggest poignant solutions to some of the biggest constraints on the Restoration Species Pool in Europe in our paper, which is 100% open access and available to anyone to read and download here: https://doi.org/10.1111/conl.12381 . Please read, enjoy, share, and get in touch with us if you would like to discuss! Baskin, C.C. & Baskin, J.M. (2014) Seeds: Ecology, Biogeography, and Evolution of Dormancy and Germination, Second Edition. Elsevier Inc., San Diego. Bekessy, S.A., Wintle, B.A., Lindenmayer, D.B., Mccarthy, M.A., Colyvan, M., Burgman, M.A. & Possingham, H.P. (2010) The biodiversity bank cannot be a lending bank. Conservation Letters, 3, 151–158. Ladouceur, E., Jiménez-Alfaro, B., Marin, M., De Vitis, M., Iannetta, P.P.M., Bonomi, C. & Pritchard, H.W. Native seed supply and the restoration species pool. Conservation Letters. Marin, M., Toorop, P., Powell, A.A. & Laverack, G. (2017) Tetrazolium staining predicts germination of commercial seed lots of European native species differing in seed quality. Seed Science and Technology, 45, 1–16. Suding, K.N., Gross, K.L. & Houseman, G.R. (2004) Alternative states and positive feedbacks in restoration ecology. Trends in Ecology & Evolution, 19, 46–53.